Beds: 1 queen, 2 twins, dbl futon in LR/crib avail. 10% discount for reservations within the week! 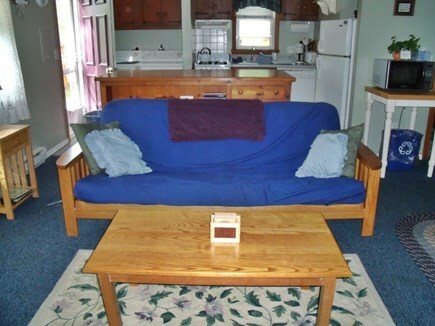 This home has a great location near the bay and ocean beaches & town cove access for kayaking. We provide all the comforts of home with a well equipped kitchen, washer/dryer, dishwasher, microwave, coffee maker, dishes, utensils, crock pot, even a waffle maker. We are in the process of installing a beautiful brand new kitchen with all new gray cabinets, a new stove and quartz countertops for the 2019 season. We chose the same new kitchen cabinets and quartz countertops as we had installed last spring in our studio apt. that is right next door to this house. See WNAV listing # 28521 for pictures of the studio kitchenette. Pictures will be added soon! The living/dining area has a ceiling fan and A/C. There are fans in both bedrooms. The master bedroom has a queen bed, and the second bedroom has two twin beds. The wrap around deck with outdoor furniture looks out onto a private back yard with a picnic table and charcoal grill. The house has deeded rights to Eastham Town Cove for kayaking. First Encounter Beach on the bay side is 2.5 miles away, and the newly renovated National Seashore Visitor Center and hiking trails are just 2 miles away. Coast Guard Beach (great for surfing) is 3.5 miles away and Nauset Light Beach 4 miles away. Eastham Windmill Green is just 1 mile from the house and is great for picnics and often has events/parades. Orleans is nearby for food shopping, restaurants, take-out, gift shops (just one mile from the rotary). North Eastham also has many gift shops, restaurants, take-out, and convenience stores. Wellfleet Audubon Sanctuary is just over the town line and has miles of walking trails and a newly renovated center. Wellfleet also boasts one of the last drive-in theaters for family nostalgia as well as an indoor multi-screen cinema. Our location makes it easy to explore both ends of the Cape -- take a day ferry to Nantucket or Martha's Vineyard from Hyannis or take in the gift shops and art galleries of Provincetown. Both are just 1/2 hour from Eastham. The house has satellite TV, a DVD/VCR and CD/radio stereo system. 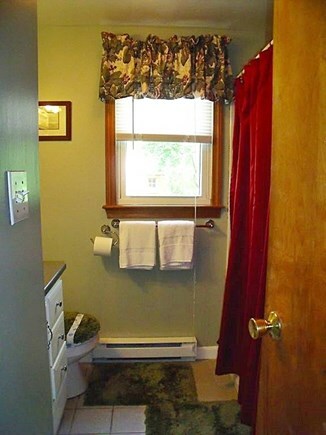 Guests bring their own sheets and towels. However, we can provide them for those traveling from away. Additional availability info: Week runs Sat-Sat in season. After Labor Day 3 night minimum and flexible week start/end. This is a Saturday to Saturday vacation rental. Additional pricing info: $200 refundable security deposit, State and local taxes of 12.45% will apply. Only two steps up in onto back door deck and two steps up into front door. We have rented this little cottage in August for two years in a row. It is a cozy and comfortable accommodation, great for a family of four or two couples who are friends. Even if it's small, inside it is quite spacious and does not lack anything. While on vacation we like to cook and eat at home. The kitchenette is functional and well equipped with pots, pans, etc., including a real Italian moka coffee pot. The big kitchen island provides a good work surface. We love the nice round charcoal Weber grill and picnic table in the backyard, we light the grill almost every night to enjoy our grilled surf and turf al fresco! 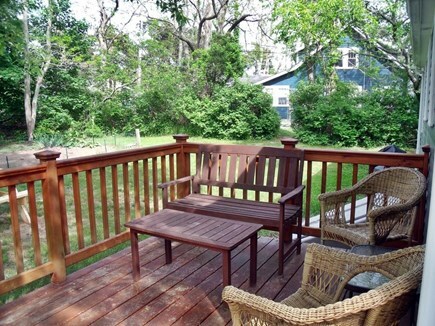 The large deck is also great for a morning coffee, late night drink, and hanging your beach towels to dry. We stayed in this Eastham Cottage for a three day weekend. The cottage was clean and well equipped, the beds were comfortable, and the cottage was just the right size for our family. We did some kayaking on the Town Cove and easily made it out to the seashore. The owners Noreen and Tom were friendly, helpful and flexible. The property is located very close to both Eastham and Orleans, two great Cape Cod towns, and is easily accessible from Rt 6. While I can hear the traffic if outside, you don't hear the any traffic sounds inside the house. We would definitely stay there again and recommend to friends. We have stayed at this cottage for more than 10 years. It is immaculately clean when you check in, and comfortable for a family of four. The casual atmosphere is very family friendly. We usually go in August and typically enjoy a break in the summer heat. There is an air conditioner, but we like to leave the windows open for the breeze that is pretty constant. 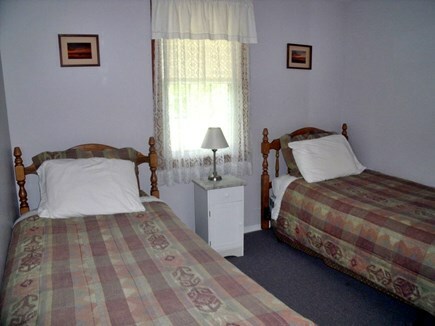 We've never had any issues with the cottage or its amenities. Tom and Noreen are very responsive if there is a problem that comes up during your stay. Once, the refrigerator wasn't working, and it was fixed in less than 24 hours. They listen to guest feedback and we have observed changes to the cottage based on comments they've received. For example, a number of additions have added to the cottage's comfort . . .a new deck, new mattress in the master bedroom, air conditioner, remodeled bathroom, fresh paint, etc. The property is very well maintained. The location is really great. 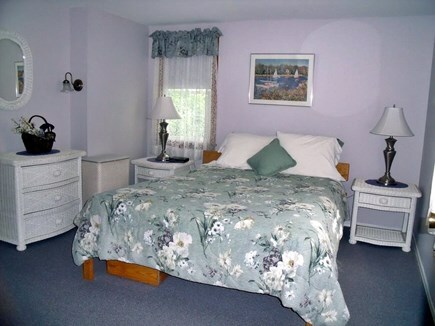 The cottage is close to the National Seashore, as well as bay side beaches and a fresh water pond. Our favorite is First Encounter Beach which is perfect for kids. At low tide, the beach is huge, and there are many tide pools full of snails, crabs, and minnows. Great Pond is also fun for more of a lake experience, and it has a great playground area. Route 6 is busy in the summer, but there are lots of restaurants, shops, mini golf, and ice cream stands to visit. It's also only a mile to a major grocery store which is super convenient. Bicycle and kayak rentals are also close by. If you stick to the bike trails, rather than route 6, you'll have an enjoyable ride. Tom and Noreen are also a good resource if you want ideas for things to do or places to go. We are very satisfied repeat guests, and would highly recommend this cottage for a family friendly, casual week on Cape Cod. We are former motel owners of a small family run motel who wanted to enjoy the beach and kayaking ourselves now and then after 16 years in the business and 14 hour days during the summer. We have been members of the Eastham and Orleans Chambers of Commerce for nearly twenty years. We now have 5 vacation rentals. Three of these are located on the Cape and listed with We Need a Vacation and two are in western Maine near the NH White Mountains, skiing, and Moose Pond, and the Saco River for kayaking. Our Cape Cod properties vary in size and include a 1 room studio apt., a 2 BR/1BA house (both in Eastham) and a 3BR/2BA house in Brewster. All are near bay and Atlantic beaches. The Eastham ones have beach rights to Town Cove a marsh beach great for kayaking/picnicking and birdwatching. The Brewster house is very near Nickerson State Park, Fisherman’s landing Breakwater Beach and Paine’s Creek Beach. Having three properties of varying sizes on the Cape allows groups of family and friends to share the same vacation week or weekend and cookouts together but still have their own space. The Eastham studio apt. 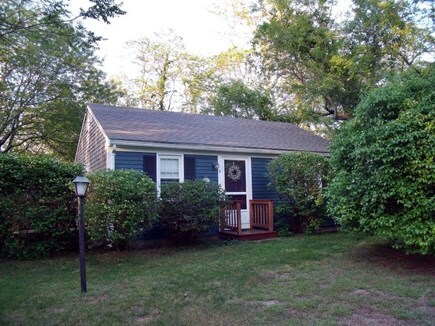 (#28521)and Eastham 2BR/1BA house (#28518) are right next door to each other and the 3BR/2BA house in Brewster (#28517)is just 15 minutes away so also near the Cape Cod National Seashore. We own our own credit card terminal and can accept the deposit by credit card (Visa /MC and Discover). For Brewster property: After selling the motel we invested in two more vacation rental properties and this one caught our eye due to the beautiful hardwood floors, beautiful new kitchen and fenced in yard in a family friendly neighborhood with low traffic volume. Proximity to Fisherman's Landing for swimming, kayaking and picnicking are also a plus. Nickerson State Park is nearby for swimming and walking trails. We also loved the sunsets and swimming at nearby Breakwater Beach and Paine’s Creek Beach. For Eastham properties: Kayaking/canoeing is a favorite pastime from our little private beach (a three minute walk). Paddling out to Hopkins Island and sitting on the big rock on the other side with a picnic lunch is a real treat especially for bird lovers! In Brewster, there are great restaurants including pizza delivery nearby. There is also a kayak/canoe rental shop nearby that will deliver rental kayaks in town. The beautiful beaches,parks and trails right in Brewster were preserved from development. Along 6A there are great little gift shops and in nearby Orleans there are three large supermarkets for food shopping. Friends Market has a beer & wine license and a great deli and take-out sandwiches. A special treat is a visit to the nearby Brewster Store, an old-fashioned General Store that has something for everyone! In Eastham, First Encounter Beach on the bay side is spectacular for beautiful sunsets. There are beautiful walking trails and Great Pond for swimming at nearby Wiley Park, the Cape Cod National Seashore and the Audubon Sanctuary is nearby in Wellfleet. There are great restaurants including pizza delivery nearby. Also Castaways Marine in North Eastham will deliver rental kayaks in town. The beautiful beaches and trails right in Eastham were preserved from development so no “Golden Arches”. Supermarket shopping is right around the corner in nearby Orleans with three to choose from including Friends Market that has a beer/wine license and a great deli and take-out sandwiches. Nickerson State Park in Brewster is also nearby for great hiking trails.